Mukeunji//Son Ja Jang/Conveyor belt sushi bar is a odd New York City multi-restaurant venue. In addition to being a traditional Korean restaurant, Mukeunji also houses Son Ja Jang, a Chinese hand-pulled noodle restaurant, and in the back, houses a conveyor belt sushi bar. Son Ja Jang is literally a hole in one of the walls of the Mukeunji dining room through which you can see a guy hand-pulling noodles. Based on the menu Son Ja Jang appears to serve Korean-Chinese food, akin to American-Chinese food, this is Chinese food adapted for Korean tastes. They serve one of my least favorite dishes, Ja Jang Myeon, a noodle dish topped with a thick salted black bean sauce. Lastly, as in all instances of this idea, the conveyor belt sushi bar seemed really sketchy, like a great place to buy not so fresh, room temperature raw fish. Mukeunji starts out the meal with a half dozen appetizer plates, including an excellent cabbage kimchi. They seem to pride themselves on their kimchi, they have a large museum style set of photos and text on the wall describing the sourcing of their kimchi. 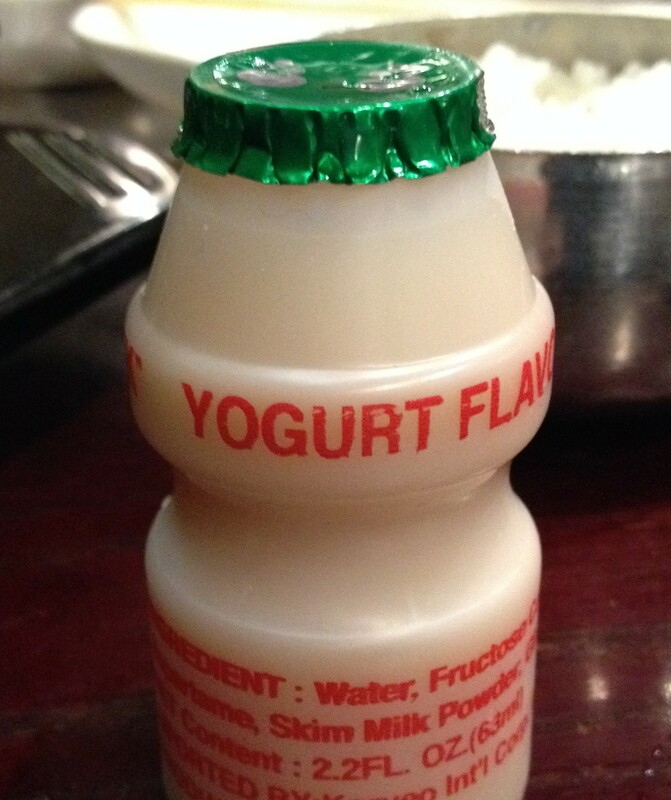 At the end of the meal they give you a little plastic shot sized bottle of yogurt drink. Yum, and I mean that for real. The Dumplings: Mukeunji serves boiled or fried vegetable dumplings and fried dumplings filled with a mixture of beef and pork; for this outing I went with the boiled. 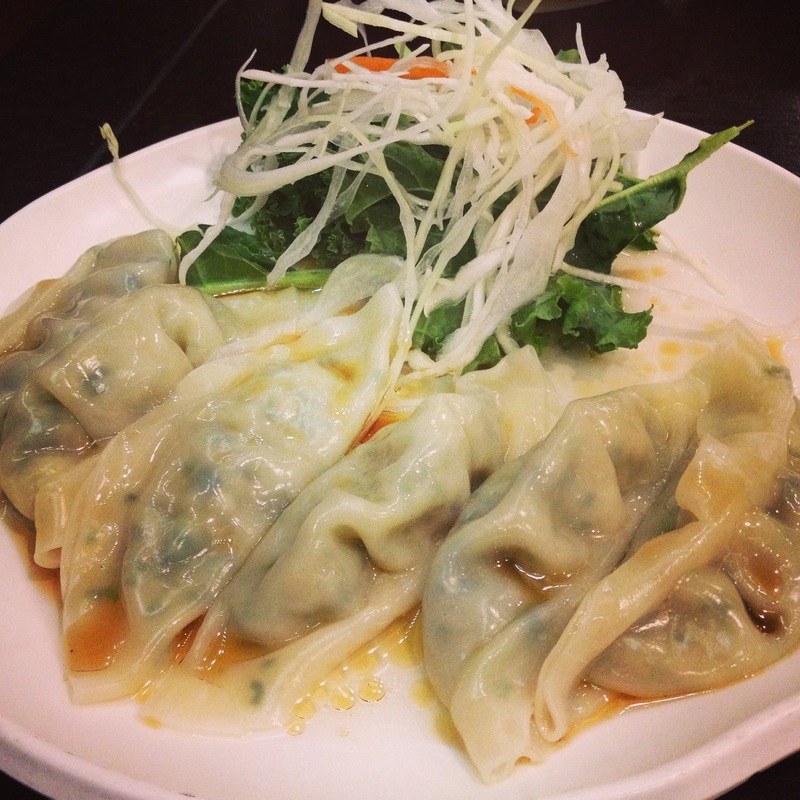 The dumplings came dressed with sesame oil which added a nice smoky nutty flavor to the dumplings. The filling was minced very fine so it was hard to tell what the filling was made of. I think it was glass noodles, scallions and based on the cruciferous flavor, some sort of cabbage. At least two of the dumplings also contained what was either the best tofu based fake pork ever, or actual pork. The waiter denied that the dumplings contained either of these options. The wrappers were pretty thin for a boiled dumpling and were a little tricky to pick up with chop sticks, especially since they were oiled up with sesame oil. The dumplings tasted quite good, but the whole “maybe pork thing” makes me wonder about this place. The Dipping Sauce: They served a fairly strong soy based dipping sauce, made with sesame oil, sesame seeds, scallions and red pepper flakes. It was salty, smoky and spicy. The Location: Mukeunji/Son Ja Jang/Conveyor belt sushi bar is located on 32nd street between 5th and 6th avenues, close to 6th avenue on the south side of the street. This entry was posted in Korea, Mandoo, Vegan, Vegetarian. Bookmark the permalink.